On 19th August 2017, Ms. Pattanan Kantisukpan, General Manager of Nong Nooch Pattaya Garden has signed on the Agreement on Cooperation in the Education Development of Tourism Careers and Manpower Development to support the Development of the Eastern Economic Corridor. 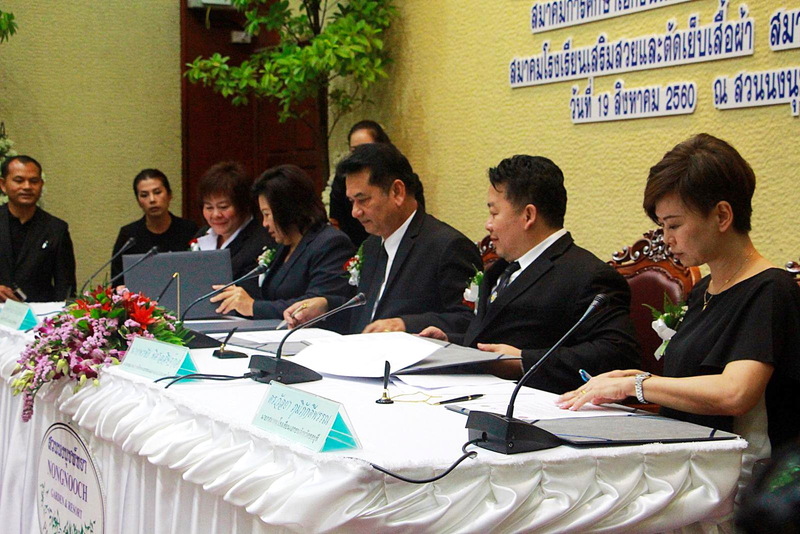 Nong Nooch Pattaya, Sattahip Distrcit, Chonburi Province has signed on the Agreement on Cooperation in the Education Development of Tourism Careers to support the Development of the Eastern Economic Corridor (EEC). 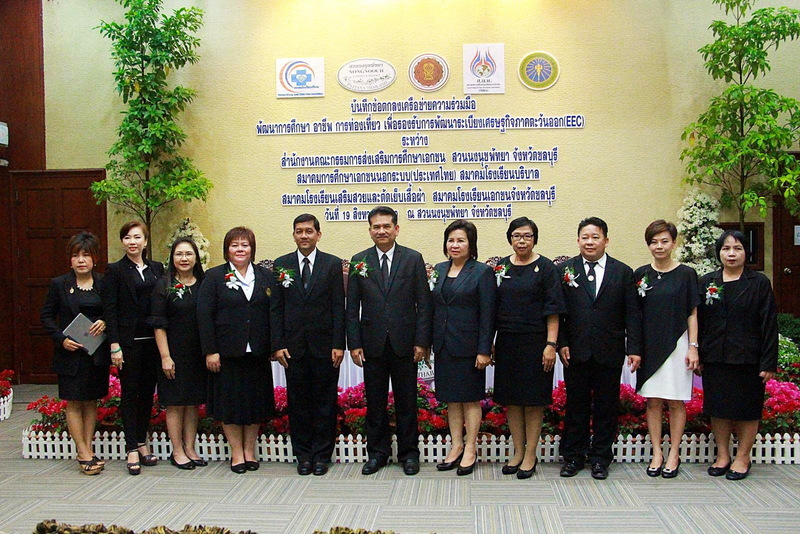 Mr.Pornchai Pisarnsitakul, President of Non-Formal PrivateEducation Association (Thailand), Dr.Payom Chinawong, Secretary of Private Education Commission, Ms. Pattanan Kantisukpan, General Manager of Nong Nooch Pattaya, Ms.Suphawadee Duangsiri, President of Nursing School Association, Dr.Wanlaya Phompakdiphan, President of Chonburi Private School Association, Ms.Siriporn Ruamsiri, the Representative of the Director General of Department of Skill Development, including Mr.Chaowalit Saeng-u-thai, Deputy Governor of Chonburi Province together have signed on the Cooperation Agreement. 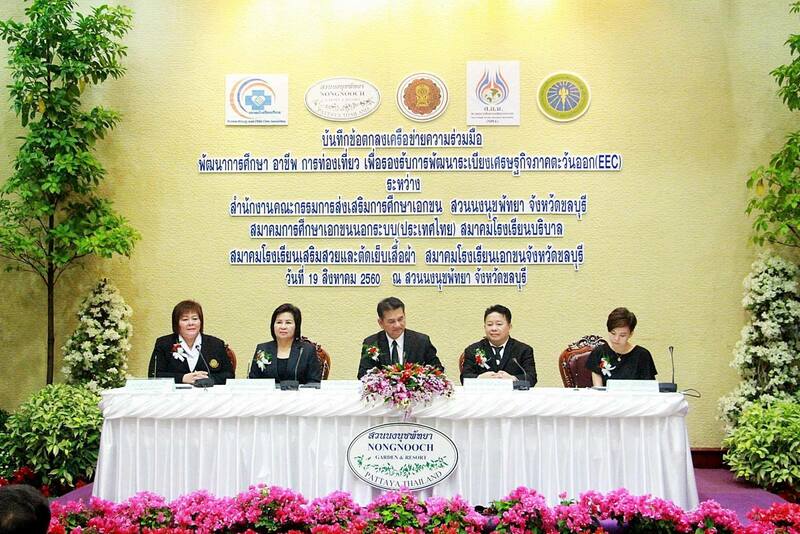 Development of the Eastern Economic Corridor (EEC) has determined three provinces in Eastern part namely Chonburi, Chasengsao, and Rayong as Economic Development Zone for Trade and Investment Promotion, Tourism, Education for Manpower Development and to enhance competence of the country to support economics activation and development. Nong Nooch Pattaya Garden is the important tourist place of Thailand at international level which has potential management with Good Governace, taking into account of stakeholders both inside and outside the business equally. 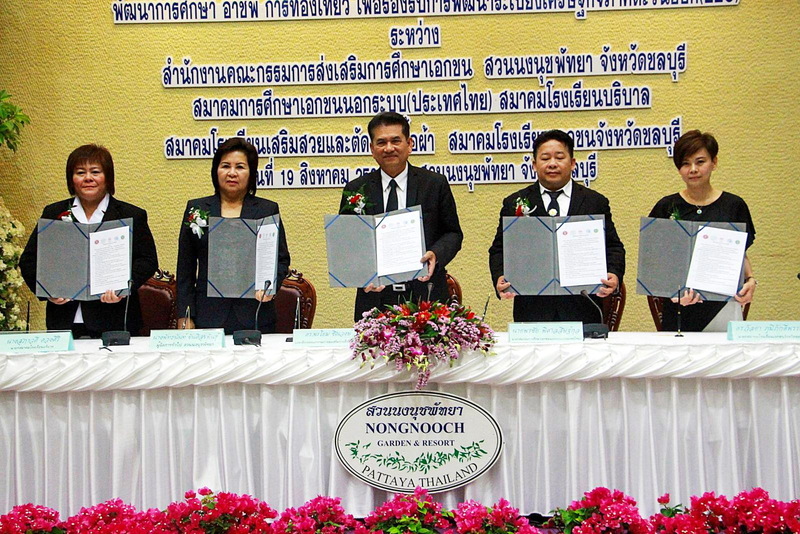 Besides, according to Management Policy that would like to promote qualified Education, Careers, Manpower Development as same as international standard, and being learning resources for tourism, agriculture, arts and Thai Culture, therefore, Nong Nooch Garden has signed on the Agreement on Cooperation in the Education Development of Tourism Careers to support the Development of the Eastern Economic Corridor.